Located 25 miles from Washington D.C. in the heart of Loudoun's wine country, Lansdowne Woods of Virginia (formerly "Leisure World") is an active adult community with seven condo buildings in Lansdowne, Virginia. Developed by IDI Group, the four high-rises, and three low-rise buildings are situated on over 91 acres and offer fabulous views of the Blue Ridge Mountains and the Potomac River. There are plenty of planned activities on-site, and each building has its own clubs and special interest groups. On-site conveniences include a hair salon, bank, convenience store, and restaurant. For off-site excursions, Lansdowne Woods of Virginia provides a fare-free shuttle bus service, which makes multiple daily trips to local shopping and service areas. Local golf courses and over 20 wineries in the area provide plenty of opportunities for off-site recreation. The 50,000 square-foot clubhouse at Lansdowne Woods of Virginia, located in the center of this gated community, offers some of the finest amenities of any community in the region - including a state-of-the-art fitness center with aerobics studio. Personal trainers are available to assist as needed. At the clubhouse, residents can also enjoy a relaxing library, billiards, indoor pool, computer center, and a large variety of activity rooms. There are hobby rooms that cater to any creative pursuit imaginable, from sewing to woodworking. This facility also has a grand ballroom that seats 300. Additional features include a chapel, bank, hair salon, and outdoor gardening areas. A unique feature of Lansdowne Woods is the rooftop tennis facility. Residents can also enjoy their own on-site dining facility: The Crossroads, an American restaurant that seats 75. IDI Group started construction of Leisure World in Lansdowne in 1998 and in 2015 and was renamed Lansdowne Woods of Virginia. There are seven buildings that encompass 1,200 units. These condos are divided among four high-rise buildings and three low-rise buildings and range in size from 874 to 2,668 square feet. Buyers can select one, two, or three bedroom units on a resale-only basis. Housing features include luxury master bedroom/bathroom suites, gourmet kitchens, fireplaces, and glass enclosed balconies/patios to make the most of the spectacular mountain, river and golf course views. Garages are available for additional fees. All utilities and building maintenance are included in the monthly association dues. Lansdowne Woods of Virginia offers so many on-site amenities that residents don't have to leave the campus if they do not want to. While each building has its own groups and clubs, The community also has a full-time activities director who makes sure all occupants - regardless of the building they reside in - have plenty of opportunities to meet and mingle throughout the year. Among other occasions, residents like to get together for card games, potluck dinners, bingo, dances, and wine tasting events. Some of the special interest groups include photography, table tennis, book club, writing, Bible study, theatre club, and travel club. Since parts of this neighborhood are on the Potomac River, residents also enjoy easy access to the waterfront. Lansdowne Woods of Virginia is located 25 miles west of Washington D.C. and seven miles from Leesburg. Residents have peace of mind with the nearest hospital only one mile away. Two malls, the Leesburg Premium Outlet Mall and Dulles Town Center, are within six miles. Historic Leesburg is home to many galleries, museums, history centers, and other cultural attractions. While Loudoun County is known for its equestrian events, vineyards, and wineries, it also has a variety of national monuments and landmarks, as well as plenty of theaters. The Dulles International Airport is only twelve miles away from Lansdowne Woods of Virginia. Lansdowne Woods of Virginia Clubhouse - 50,000 Sq. Ft. There are plenty of activities available in Lansdowne Woods of Virginia. Here is a sample of some of the clubs, activities and classes offered here. 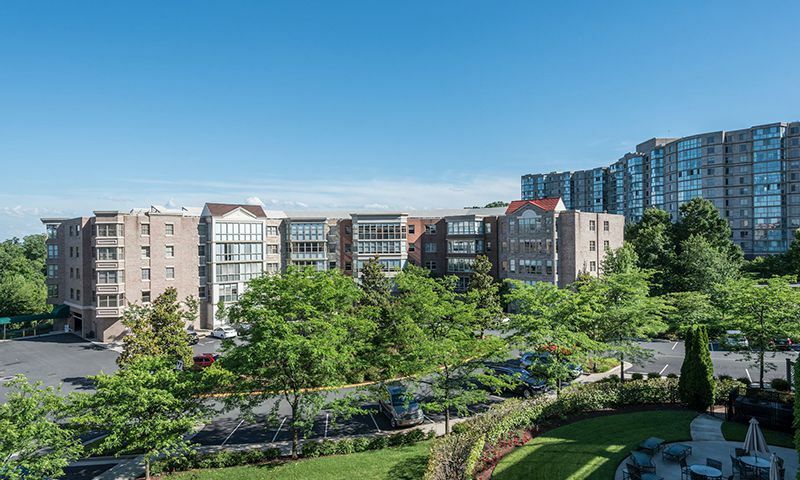 Lansdowne Woods of Virginia is home to 5 high-rise condo buildings that offer a variety of styles. Typically the condos range from 1,513 to 2,821 square feet. They can have anywhere from two to four bedrooms, two to four bathrooms, and there are assigned parking spaces. Please Note: Floor Plans are not available at this time. The best decision we ever made was to move here. People are friendly and activities are abundant and varied. I love the pool and attend water aerobics classes when I can. Movies and live shows are offered at the clubhouse to meet anyone's taste. I play lots of bridge, Mah Jongg, Bingo, and go on many of the trips both local and International. The line dance classes are a definite plus. Each building provides many activities and you can do as much or as little as you want! I could go on and on!! Living here is great. We downsized from a single family home in exchange for condo living to give us more time to enjoy life rather than maintain a house. It's great having so much more free time to spend doing things we like to do. We travel a lot, volunteer in the community, we golf and participate in lots of the clubs here. It's a friendly community and there is always something to do. 55places.com is not affiliated with the developer(s) or homeowners association of Lansdowne Woods of Virginia. The information you submit is distributed to a 55places.com Partner Agent, who is a licensed real estate agent. The information regarding Lansdowne Woods of Virginia has not been verified or approved by the developer or homeowners association. Please verify all information prior to purchasing. 55places.com is not responsible for any errors regarding the information displayed on this website. 55Places.com is in no way affiliated with the developer of Leisure World&amp;amp;amp;amp;amp;amp;amp;amp;amp;amp;reg; Virginia. The information you submit is distributed to the Community Adviser. The information regarding Leisure World&amp;amp;amp;amp;amp;amp;amp;amp;amp;amp;reg; Virginia has not been verified or approved by the developer. Please verify all information prior to purchasing. 55Places.com and the developer are not responsible for any errors regarding the information displayed on this website. Leisure World&amp;amp;amp;amp;amp;amp;amp;amp;amp;amp;reg; is a registered trademark owned by RRLH, Inc. 55 Places, LLC and www.55places.com are authorized by RRLH, Inc. to use the Leisure World&amp;amp;amp;amp;amp;amp;amp;amp;amp;amp;reg; service mark.